Adam Jacobs' star inning helps BECC claim fifth win of season. Belmont & Edgware CC claimed their fifth win of the season thanks in no small part to captain Adam Jacobs. Belmont made the journey west to Hayes CC in slightly apprehensive mood, having lost the previous fixture, a mid-week T20. However, captain Jacobs finally won the toss and elected to make first use of the pitch in batting friendly conditions. The two Mayers opened up. but only succeeded in putting on 14 before Phil spooned an attempted pull to mid on. That brought Joel Freedman to the crease. He and Elliott played some attractive shots but before their partnership could really develop, the younger Mayer was bowled, having been hit nastily on the toe shortly before. Jacobs was the next man in and looked to attack from the off. He soon found the pitch to his liking and hit a number of sweetly timed drives to the boundary in a statement of intent. 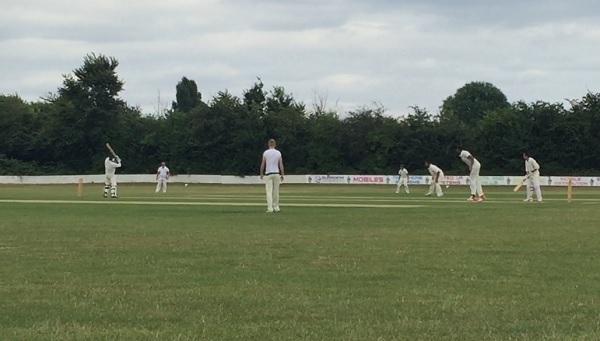 The third wicket pair rapidly put on 49 before Freedman was bowled attempting to clip the newly introduced spinner off his middle stump to leave BECC at 78-3. That soon became 78-4 when Taylor, who has been enjoying a good summer with the bat, was out for a golden duck, nicking off to slip after trying to cut a wide delivery. James Brilliant, coming in at 6, stabilised things however. Using a straight bat, and playing sensibly, he took on the anchor role as Jacobs grew increasingly expansive in his shots. This continued despite the introduction of Hayes’ best bowler, a 6 foot 8 quick, who extracted plenty of bounce. A good battle developed, whereby the no.4 was able to hit several boundaries, whilst he quicky beat the edge a few times. Eventually though, Jacobs, having reached 70, received a ball which nipped off the seam and (literally) shattered the off stump bail. From there, Belmont were able to finish the innings positively. Although Brilliant was out shortly after Jacobs, for a patient and well-made 25, Micahel Blasebalk kept the momentum up by hitting a breezy 18, before the lower order were able to drag BECC to 213-9 off the full 40, finished off with Jack Mendel’s seven off the final over, it was undoubtedly a competitive total. 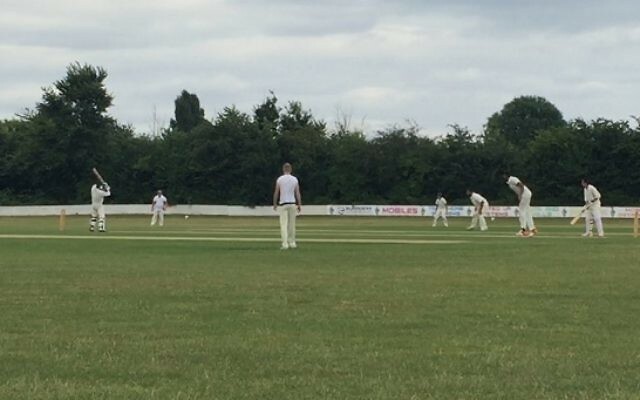 Although both opening bowlers (Jacobs and Tilley) started solidly, and generated a number of chances and near misses, Hayes’ openers were able to get off to a reasonably quick start and put on 60 within about 11 overs. Neverthless, when Jacobs finally trapped Vini lbw for 21, after a full ball kept slightly low, this triggered a full-on collapse. Destroyer in chief was Stephen Berlofsky, who snaffled a five-wicket haul. He bowled excellent lines and lengths, whilst varying his pace, to cause the batsmen all manner of problems. He was also well-supported by some sharp ground fielding and solid catching from Brilliant. If Berlofsky was Hayes’ chief tormentor, the wily Simon Taylor was his right-hand man. He removed a number of dangerous batsmen cheaply, including Hayes’ no. 7, Jaz, who had demonstrated in the home fixture this season that he was capable of hitting a long ball. Overall, Taylor finished with figures of 4-20, whilst Berlofsky’s were 5-22. Unbelievably, therefore, Hayes collapsed from 62-1 to 91 all out within the space of about 10 overs and handed Belmont a crushing victory by 121 runs. With a number of youngsters now pushing through and the team beginning to develop some strength in depth, BECC will now be pushing for several further victories before the end of the season.